Nelson Mandela was a pretty tough man, especially when his grandson got out of line. Never mind that Mandela was South Africa’s first black president. Or that he was an enduring anti-apartheid fighter. To his grandson, he was a disciplinarian. 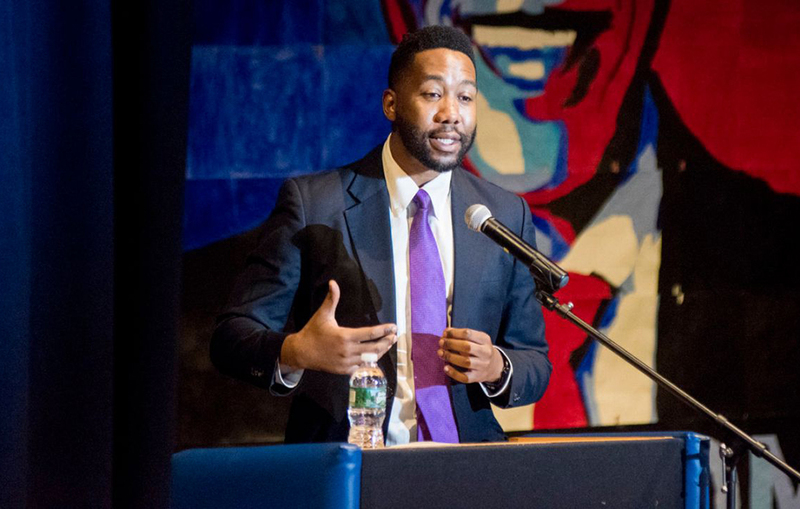 Ndaba Mandela, now 36 and an activist himself, spoke about his grandfather Thursday, April 4, in an auditorium at Hempstead High School packed with more than 500 students. Mandela moved in with his grandfather when he was 11 so his parents could study at a university. Nelson Mandela was serving as South Africa’s president after spending nearly three decades behind bars as a political prisoner. Then there was the day he lost a school jersey — for the second time. His grandfather told him he had to sleep outside as punishment. A cook handed him a blanket. As evening approached, his grandfather called him over. Mandela is following the footsteps of his grandfather, carrying the lessons he learned from him. Nelson Mandela died in December 2013. The younger Mandela co-founded Africa Rising, a nonprofit foundation in his hometown of Johannesburg that works to improve Africa’s image worldwide. He also works to eradicate HIV/AIDS, a disease that not only has devastated Africa but took the lives of his mother and father. The students cheered Mandela when he told them they must keep fighting for social justice. Americans, he said, don’t talk enough about the injustices in the United States. The room broke into applause when Mandela talked about the transformative power of dreams, encouraging the students to put everything they have into the choices they make in life. He used his grandfather as a prime example. “As a child, he was barefoot, no shoes, and he rose to become one of the most loved leaders,” Mandela said. As South Africa’s president in the 1990s, Nelson Mandela worked to dismantle the legacy of apartheid and foster reconciliation between the country’s white and black residents. Mandela’s speech enthralled senior Amneris Greenidge. Joseph Akinola, another senior, also connected with Mandela’s message of limitless potential.